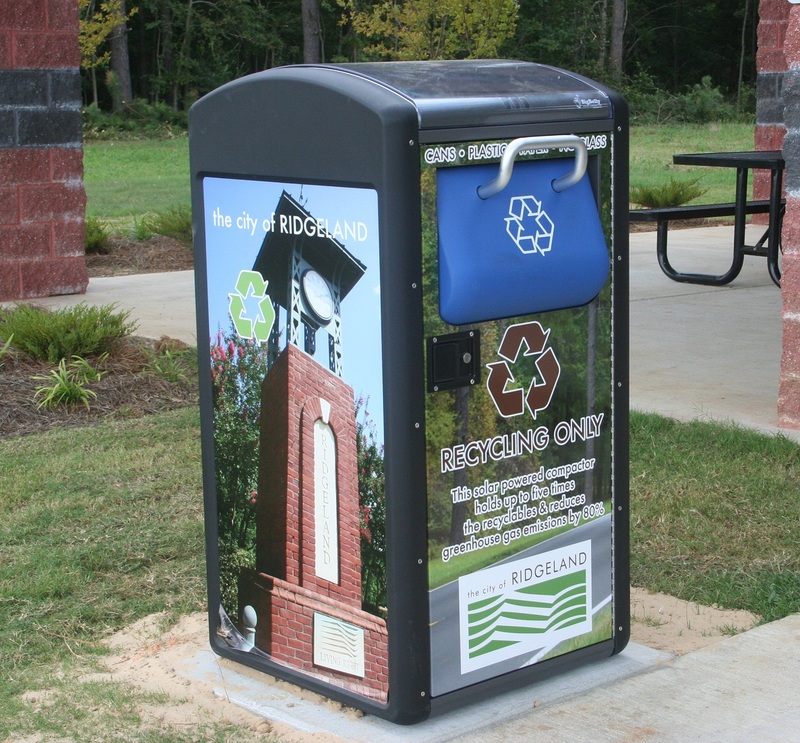 To enhance recycling efforts, the city of Ridgeland purchased five solar-powered recycling compactors. You can find them at the concession stands at Freedom Ridge Park and at the trailhead pavilion of the multiuse trail (off Rice Road). You may recycle cans, plastic and paper. If the light is green, the compactor has room for recyclables. If it’s yellow, the compactor is full and red means it’s overflowing. Each compactor can hold up to five times more than regular garbage cans. Since the compactors do not have open tops, the recyclables will stay inside and not blow out. The compactors come with a solar grid in the top, providing the energy source for compacting and the alert system. An interior wireless chip and antenna sends a signal to a main server, providing data that can then be accessed from a web app. The app allows designated city employees to see a map of which of the compactors are full and which are empty. The city is committed to staying clean in an energy efficient way, proving a model for other Mississippi cities to follow. The city has earned awards for efforts in recycling and green living, such as – 2013 First Place Local Government Award from Keep Mississippi Beautiful, Steward in the Mississippi Department of Environmental Quality’s enHance Program since 2011, 2011 Local Government Recycler of the Year from the Mississippi Recycling Coalition, Tree City USA certification since 2009, Merit Award from the American Society of Landscape Architects for the Ridgeland Area Master Plan and the Mississippi Municipal League’s Planning and Development Award for the Ridgeland Area Master Plan.